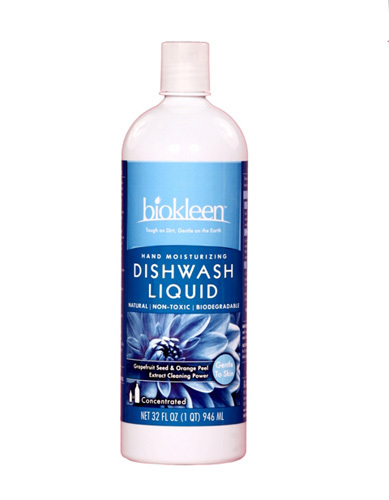 Our Hand Moisturizing Dishwash Liquid is like all Biokleen products, is clear of dyes and brighteners. Cuts through tough grease and baked-on-foods without the use of toxic chemicals. Dishes dry spot-free with no chemical residue or taste. BioKleen Dishwash Liquid (Hand Moisturizing) is also a great Hand Soap and Bubble Bath for People and don't forget Fido; it's wonderful Pet Shampoo. Aloe Vera enhances fibroplast function. Fibroplasts are those remarkable little cells responsible for collagen formation. They also assist in the soothing of minor burns, cuts, scrapes and skin irritants. WE ARE THE ENVIRONMENT Our everyday cleaning choices affect our health, the health of our families, and the health of our planet. BioKleen products are concentrated in order to leave THE smallest footprint on the environment. Concentrated = Fewer Fillers = Less Waste = Less Packaging = Less Energy Used in Shipping = More Value for Everyone.